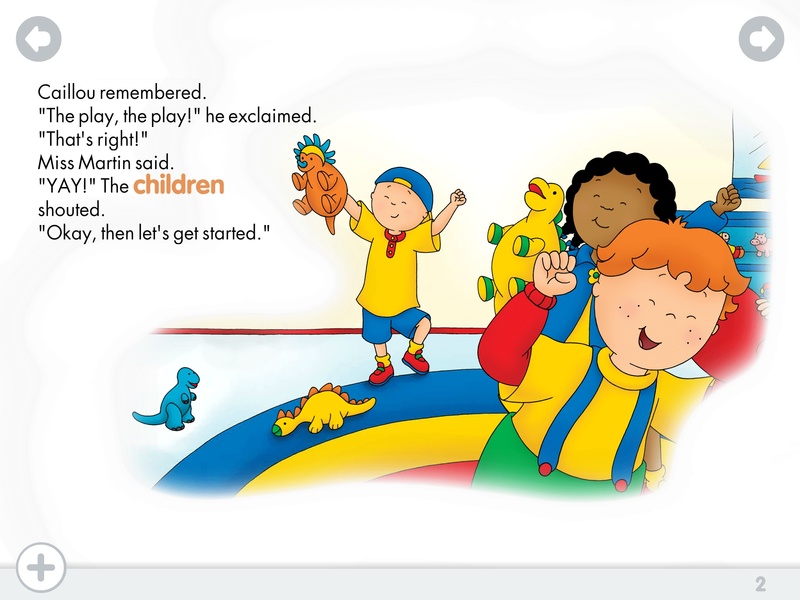 This delightful interactive e-book features Caillou, the main character from a long-running television show as he and his friends jump into the world of class plays. The “read-with-me” format offers loads of opportunities to nurture early literacy and language skills. Caillou: My First Play shows that developer Tribal Nova has yet another winner to add to their collection of apps for young children. This is the second Caillou e-book, and it’s bound to be a popular choice, especially for children who already know and love Caillou from the television series. The e-book truly shows off the capabilities of the iPad and uses many features to create an outstanding experience for parents and young children to share together. Every aspect of this app is high-quality. It offers many options and levels to personalize the experience, too. This app is built for parents and children to enjoy together, which researchers are finding is a vital component to reading readiness. The prompts and suggestions are tailor-made to help adults know just what to do to take advantage of the app’s many features. 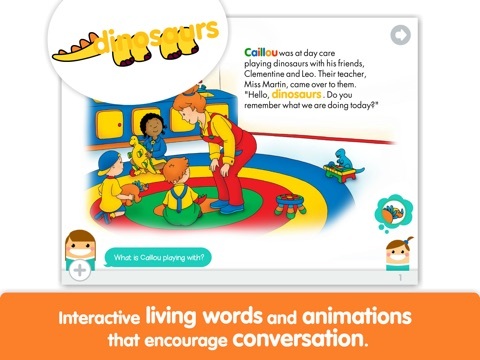 This app is based on a system called “dialogic reading,” which simply means that an adult or other able reader carries on a conversation, or dialog, with the young child as they enjoy the book together. Dialogic reading is one of the tools that parents can easily use to open the door of literacy for their preschooler. In addition to prompts and suggestions scattered throughout the pages of the e-book, there is also a great list of tips or reminders for parents that will help everyone make the most of this great opportunity. Every adult will want to check out the “Reading Tips” tab found under the “settings” section of the app for great interactive ideas. 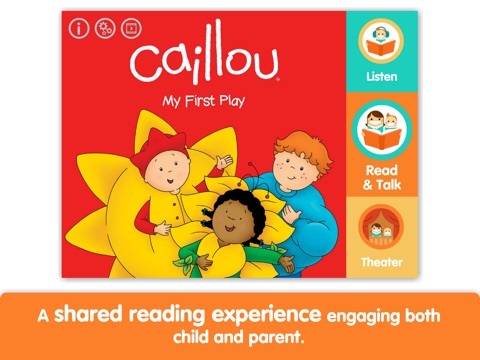 Caillou: My First Play will join that group of apps that become your child’s favorites, much like well-loved story books. The app features a read-to-me mode that will allow independent use, but I would recommend that you not use that until the two of you have used the app together a few times. This will maximize the system’s impact on your child’s progress. Each page has interactive hot spots that cause characters to move around or add sound effects to the story. The Read-and-Talk section offers conversational prompts that can really open up language and comprehension skills. There are even hits if your child needs a hand responding to the questions. And who doesn’t love recording? 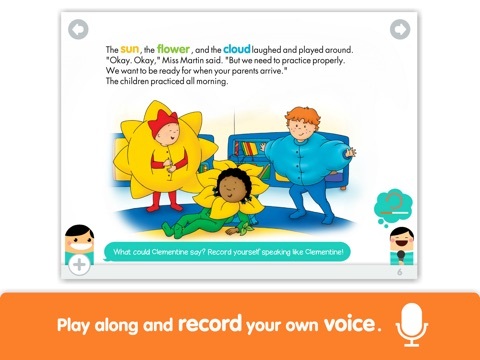 Adults can record the “living words” in their own voices, which will please young users. 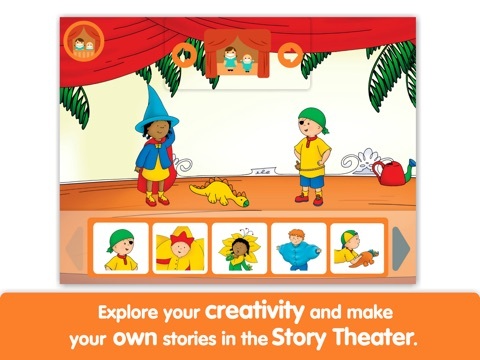 In addition, the app includes a “theater” section, where children can choose a background scene, add characters and props, and then record their own voices as they create their own imaginative story. Caillou: My First Play is a great value. 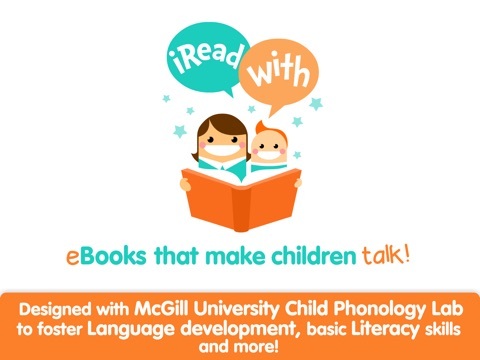 The app offers a sound and effective beginning reading experience for the very young, and models research-proven ideas that help adults take advantage of the app’s power to build literacy skills. Best of all, adults (parents, care givers, teachers, mentors) can generalize the ideas used in this e-book to use with any book at all. The techniques of dialogic reading will help your child succeed. Developers did a good job of avoiding outside advertising, in-app purchases, or links to social media. The parents’ section is protected by a button that must be held for three seconds, but the filling graphic may be attractive to a curious young child, so it’s far from fool-proof. Inside the parents’ area, there are links to subscribe to the newsletter, as well as links that open the web browser to the unprotected internet. This is a concern, since it is so easily-accessed. Furthermore, the Settings section, which contains access to the level, the recording system, and other features, is not protected at all and probably should be. As it stands, young children could access and/or accidentally record over some of the features that make the app so valuable, or change settings to make the app less useful for themselves.